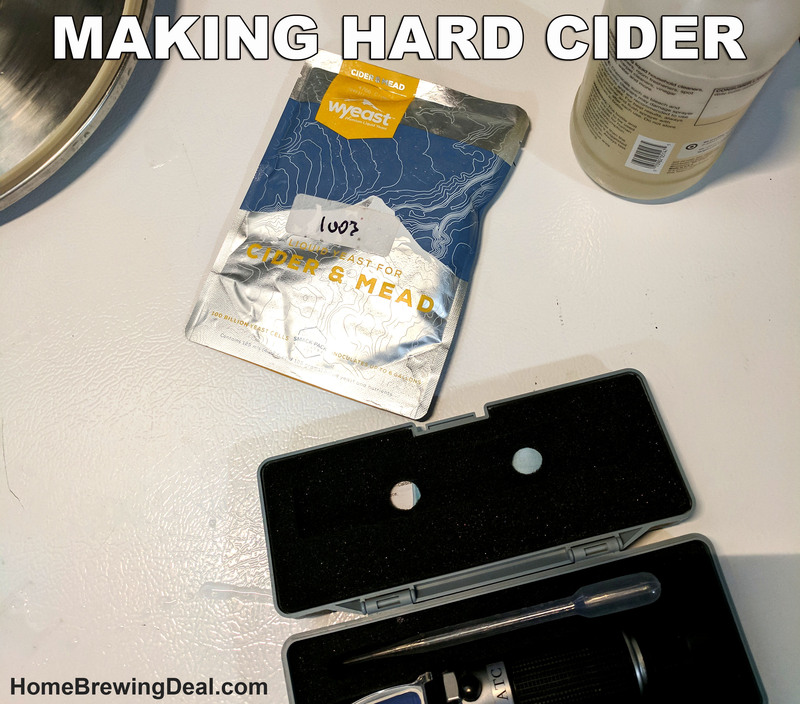 After reading all of the directions that were included with my home cider making kit, I was pleased to learn how simple the process was. Step #1 was to boil 1 gallon of water with the dextrose that I purchased. The dextrose that I used was actually initially purchased for carbonating beer, but since I almost always keg now, I decided it to put it to good use for my batch of home made hard cider! 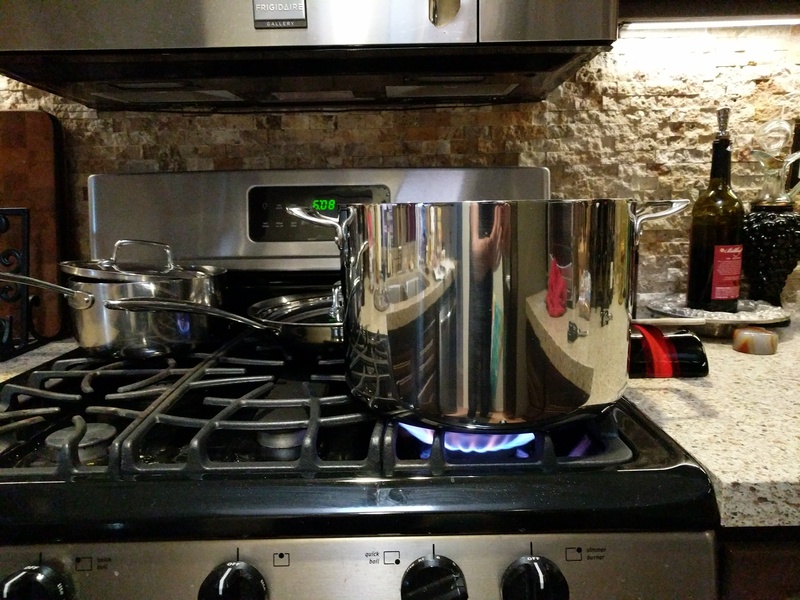 I used a large stainless steel kettle to heat 1 gallon of water. Once the water was hot, I began to add the dextrose and slowly stir it. Make sure that you use a large enough pot to boil the water and dextrose. If the boil becomes to rapid, you can have a boil over and those are no fun to clean up! I let my water and sugar boil for approximately 10 minutes and then turned the burner off. At that point your should let your water and dextrose solution cool down. You can either let it sit in an ice bath with a lid covering the kettle, use an immersion chiller or add some ice to the kettle; just be careful to keep everything sanitary. Just like home beer and wine making, cleanliness and sanitization are critical to making great cider! At this point you will want to make sure that you clean and then sanitize anything that will come in contact with your cider or water dextrose solution! Both the water and apple cider concentrate are loaded with sugars and any bacteria or wild yeast strains lurking about would just love to get hold of it! So make sure you sanitize your fermentor and any implements that will come in contact with your home made cider. I recommend Star San, but you can use any odorless and tasteless food grade sanitizer. The cider fermentor that I use is a 7 gallon stainless steel fermenter which I first cleaned with PBW and then sanitized with Star San. If you are looking for an incredible cider fermenter, I highly recommend this one and you can get it for a great price and with free shipping. 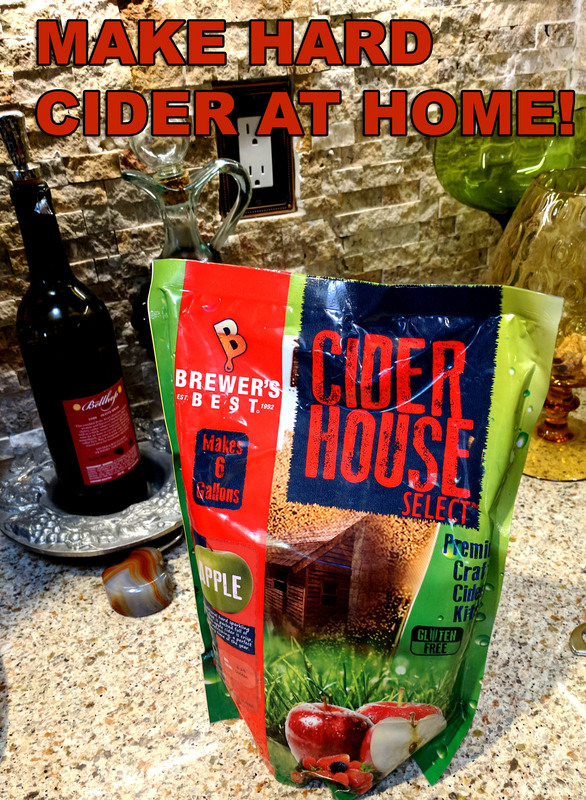 You can also use plastic fermentation buckets, or glass carboys as cider fermentors. If using a glass carboy, just be very careful not to add boiling hot liquids as the fermentors can shatter making for an incredibly dangerous situation! There are also stainless steel 7 gallon brew bucket fermenters for just $229. The next step is to add your different home cider ingredients to the sanitized fermenter. I first added in my boiled water and dextrose solution. Be careful as this still may be very hot! Next I added in the package of apple cider concentrate that came with my kit. Make sure that you sanitize the outside of the package and even the scissors that you use to open the kit, just to be safe! After pouring in the mixture, rinse the pouch with filtered and dechlorinated water (I use a carbon filter and seen in the photo, which highly reduces chlorine levels); and add the water to the fermentor. I then tossed in my oak cubes and filled the fermentor to the 5.5 Gallon level. The home made cider directions recommend filling it to the 6 gallon mark, but as I mentioned earlier, I like to live on the edge! You will want to make sure that your fermentor can support at least 7 gallons if not more! Keep in mind, the more sugar you add and the less water you add, the stronger your cider will be! So use caution! Yeast is a delicate and will parish if the temperature of your cider is too high! The ideal fermentation temperature for cider is between 65F – 70F. So, cool your cider down to no more than 70F before you add your yeast to the cider mixture. You also do not want your temperature too low or else the yeast will not activate, so try to get it above 65F. I use a converted chest freezer with a digital temperature controller as a fermentation chamber so that I can keep a stable fermentation temperature. If you do not have access to one, do your best to keep your cider fermentor in an area that has a stable temperature of approximately 67F. 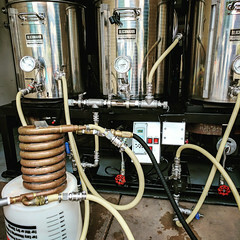 Keep in mind that the fermentation process generates heat and your cider will be warmer than the ambient temperature of the room that the fermentor is residing in. Next add your yeast to the fermentor! The fermentation process for you cider will take about a week to complete, but may take more or less time depending on a variety of factors including temperature, quantity of yeast, health of yeast, quantity of available sugar and type of yeast. 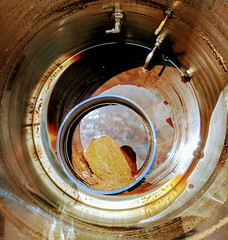 You should begin to see fermentation activity within 24-48 hours of pitching your yeast. If bubbles are not forming in your air lock, your yeast may not have been healthy enough for fermentation and you will need to add new healthy yeast as soon as possible. It is always wise to keep some dry cider yeast on hand, just in case this occurs. Dry cider yeast is far more durable than liquid cider yeast. After the fermentation is complete almost all of the sugars will have been converted over to alcohol and the cider will be very dry. So at that point I will add a sweetener to the cider that the yeast in unable to convert. This will help to intensity the apple flavors in the cider. At that point I will also keg and carbonate my cider and it will be ready to server approximately 7 days after that. Once completed I will post the results! 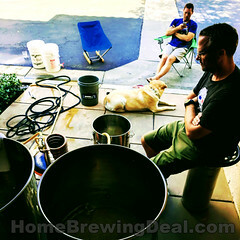 You can purchase everything that you need to make cider at home at MoreBeer.com. Here are links to some of the items I use! 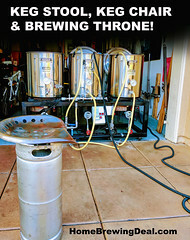 MoreBeer is great because you get free shipping on any order over $59, they have some of the lowest prices available on home cider making ingredients and cider making equipment and incredible customer service! If you have any questions or comments on home cider making, please let me know!